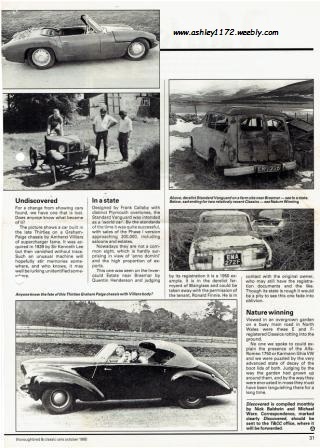 "Thoroughbred & Classic Cars" Magazine October 1985 Issue. At this time it was thought to maybe belong to a Martin Turner of Dorset. which would have had some story to the photo was missing. 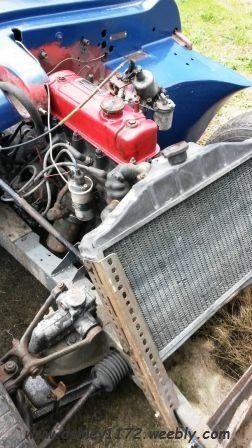 The car is built to a very high specification, including Bowden chassis complete with Bowden IFS and all round telescopic shock absorbers, full Aquaplane tuning gear, including cylinder head, manifolds, etc, and it has the distributor mounted on front of timing cover - Interesting! 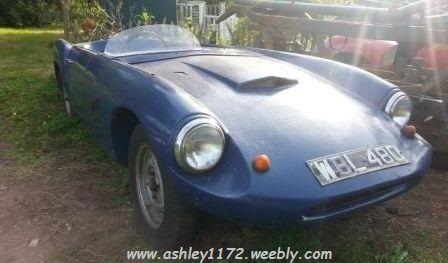 It has a Morris 8 - 4 speed gearbox, a Bowden fully hydraulic brake system, high ratio rear axle diff, Ballamy 15" wheels, a very full instrumentation dashboard and Super Accessories Woodrim steering wheel. The seller at the time was Alan Keble of Andover and it was sold to someone around the Salisbury-Fordingbridge area. 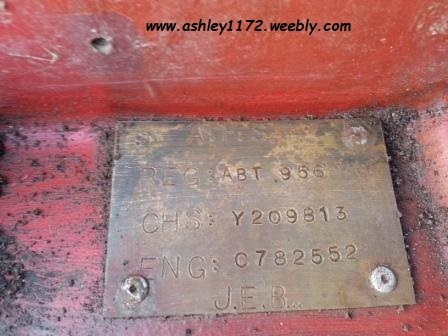 I have just acquired what appear to be the remains of Ashley 1172 Reg No. ABT 956. 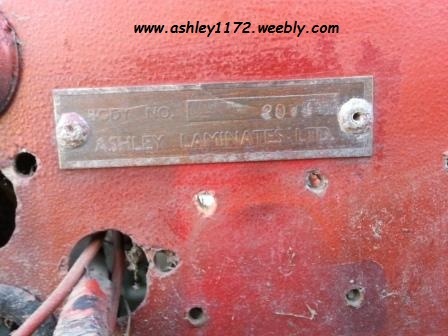 I bought it on ebay with a Ballamy LMB / Reliant Sabre chassis and log book but on inspection of the body I came across a plate with the details of the Ashley. It also came with another chassis frame and this appears to be a Bowden as you list in the chassis list. I have some photos of the assembly of bits and wondered if there was any way I could reclaim the original reg number. 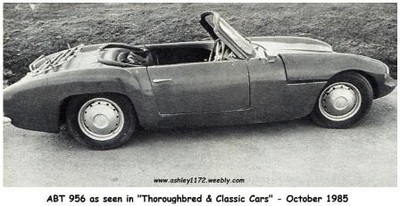 Do you have any further info on this car? I replied as best I could and sent a link to a page titled reclaiming-registrations and Robin sent me some photo's below of the car as shown on eBay and as he received it. 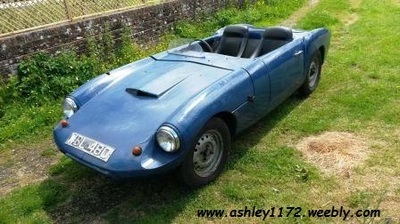 These photo's also show the two chassis's included in the sale. but it looks like the Bonnet & plate comes from a different Ashley 1172 judging by the colour differences, maybe the original got damaged. 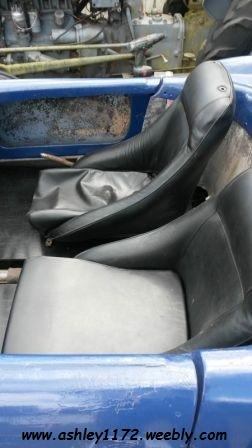 The 2 light Blue car photo's are shown by the seller to indicate what the car could look like when restored. now restored, running and at displays in UK, also a forerunner to the Reliant Sabre. REG: ABT 956 Registration No. J.E.B J.E.B Car builders name initials ??? The words in RED are only my assumptions! This is a stalled project for rebuild. It is a rare (and in my opinion attractive) Ashley bodied special from the late 1950s / early 1960s. 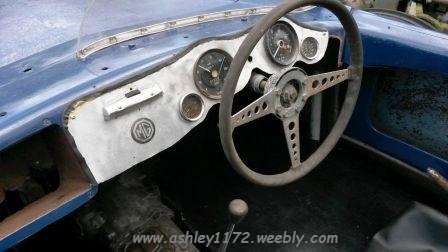 The chassis is early 1950s MG with a 1622cc B-series engine. It has disc front brakes and live leaf sprung back axle. 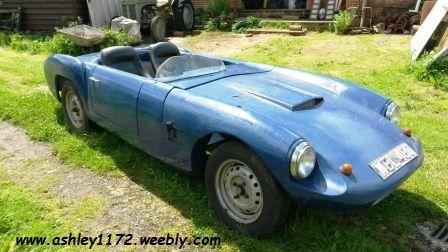 I have had the engine running on slave tank and it sounded good but the car is sold as needing total restoration. I am selling this due to the acquisition of another (better) project! Please email for more details, I'll try to answer your questions. Better still come and see it. Yes, it was Robin's Ashley 1172 but under the Registration No. WBL 480 that was shown on the bonnet of ABT 956. 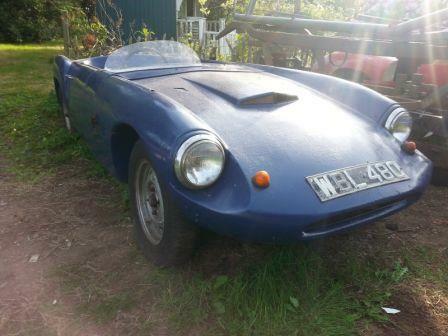 ABT 956 registration, chassis and engine numbers !!! Must be spam, sorry about that. I'll change my password! 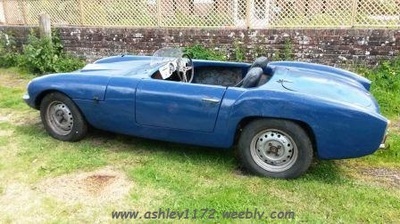 Sadly I never had ABT 956 in it's entirety, only the bodyshell less bonnet which came from another 1172 shell. 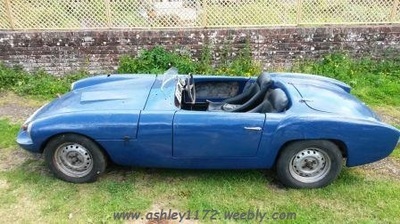 The bits I fitted to a MG chassis and sold into Belgium last year. for the buyer in Belgium, but have had no reply as yet. and I will hear from him in Belgium sometime.